Riverview varicose vein treatment center, The Vein & Vascular Institute of Riverview, offers varicose vein surgery techniques that are performed using Endovenous Laser Ablation and Sclerotherapy Injections for safe vein removal with quick recovery time. Varicose vein disease affects over 24 million people in the United States alone. If you are suffering from varicose veins, it’s important to realize that varicose veins are a serious medical condition that only get worse with time. If left untreated, varicose veins only get bigger and can become painful. They can eventually lead to dangerous blood clots that can cause a pulmonary embolism, heart attack, and even stroke. When the valves in your veins start malfunctioning, the blood that is supposed to flow back up to your heart leaks downward and starts to accumulate in your leg veins causing tremendous pressure on the vein walls. When the walls of your leg veins start stretching because of the increased pressure, the veins bulge, forming a varicose vein. When blood continues to accumulate in your varicose veins, your chances of developing a blood clot in those veins increases with every day that goes by. Varicose vein removal is the only way to eliminate your bulging varicose veins. At The Vein and Vascular Institute of Riverview we offer a number of varicose vein treatment options, depending on your specific condition. We are mindful of the fact that every patient’s cosmetic and health issues are unique. Our Board Certified Vascular Surgeons are committed to providing our patients with the most appropriate, safe, and technologically advanced vein treatments available anywhere in the world. Our Riverview vein doctors perform a minimally-invasive laser closure technique that does not require sutures or staples, where only the diseased veins are removed. This state-of-the-art varicose vein surgery technique called Endovenous Laser Ablation (also known as EVLT procedure) is preferred since it offers quick recovery time and leaves minimal to no scarring on your legs. 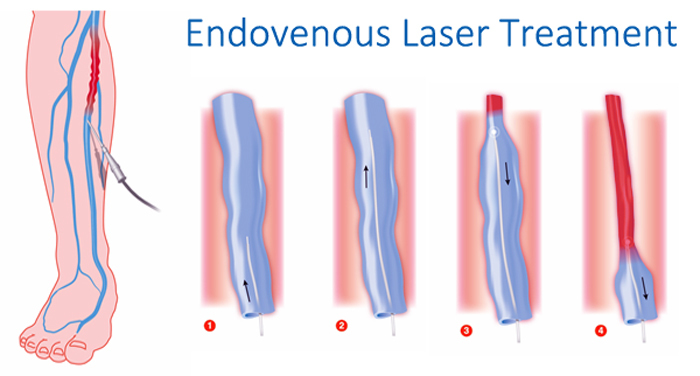 During varicose vein laser ablation a thin catheter is inserted into the vein through a tiny incision. Then, laser energy is transmitted to the vein wall through the catheter. The laser energy causes the vein wall to heat up, cave-in, and seal shut. Gradually, the vein will dissolve into the surrounding tissue. This laser vein treatment procedure takes only about 45-60 minutes. But, taking into consideration the time needed for pre-treatment and post-treatment procedures you should plan to spend a total of 2 hours in our office. If you would like to see what to expect when having the EVLT procedure performed at The Vein and Vascular Institute of Riverview, you can watch the EVLT Pre-Op Video. Is laser vein treatment painful? The treatment area is numbed using local anesthesia. The majority of our patients do not feel any pain at all during the EVLT procedure, whereas, a few patients have reported that they experience mild discomfort during and after the procedure. Right after laser varicose vein treatment patients are actually able to walk right out of the treatment room. Another way to quickly and safely remove your varicose veins is through the use of sclerotherapy treatment. Sclerotherapy is performed by simply injecting a saline solution directly into your varicose veins. Similar to laser vein treatment, sclerotherapy causes the vein walls to collapse and stick together, safely and permanently closing the vein. The closed vein becomes scar tissue that fades away, making your varicose vein disappear and leaving your leg with minimal to no scarring at all. The sclerotherapy procedure can take anywhere from 15 to 30 minutes per session. The number of veins injected during a session will depend on the size, quantity, location of the varicose veins, as well as the general medical condition of the patient. Immediately after varicose vein surgery, our vein specialist will wrap the patient’s leg with a compression bandage. Patients are instructed to keep the leg elevated for the rest of the day. On the following day, our patients are usually able to return to work and normal activities, free of swelling and pain. It is recommended to avoid strenuous activity for two to three weeks after the procedure. It also recommended that our patients wear compression stockings for two to three weeks after the procedure as well. Our patients are often concerned with varicose vein surgery cost. Sometimes it is one of the reasons why patients delay getting vein treatment. That is why we always stress that varicose veins are not just a cosmetic issue, they are a serious medical condition that could be fatal if left untreated. Since varicose veins can be life-threatening, varicose vein treatment is covered by most medical insurance plans. Why choose our varicose vein center? Unfortunately, many cosmetic centers offer vein treatments that may be excessively priced, out-dated, more risky, and not as effective as the technologically advanced and minimally invasive procedures offered at The Vein and Vascular Institute of Riverview. Traditional stripping and ligation has long been the method of removing large varicose veins, with smaller veins removed surgically as well. However, now with the mastery of less invasive techniques at The Vein & Vascular Institute, the traditional stripping and ligation procedure is no longer performed at our vascular clinic. At our vein institute, we diagnose and treat your vascular system as a whole. Vein and artery treatments are our specialty and our vein experts are Board Certified in Vascular Surgery and extensively trained in vein removal procedures. That is how we are able to offer the most revolutionary, safest and most effective varicose vein removal treatments available anywhere. That is why when you decide to have your varicose veins treated at The Vein and Vascular Institute of Riverview, you can be confident in knowing that you are getting the best possible care. If you are suffering from varicose veins and if you are looking for the most qualified, highly trained Board Certified Vascular Surgeons in the Riverview, Florida area who can quickly, safely and painlessly remove your veins using the latest technology and techniques available anywhere, give us a call at (813) 999-3992 to schedule a vein consultation.